MacSpeedZone says: "The new 900 MHz iBook does not break any performance barrier, but it is a solid performer. For a portable it does well in drive performance, and in CD-R burning it stomps the competition by coming out 19% faster." "Although the iBook has a good sized, speedy, L2 cache, it does not, unlike most of the latest PowerBooks, have a L3 cache (neither does the 12 Inch 867 MHz PowerBook). You will see this have an effect on some of the scores . . . such as the Large Document tests." The G3 iBook performs surprisingly well against its G4 stablemates for many tasks, with the exception of running applications that are optimized to take advantage of the G4's AltiVec engine (mainly Apple's own iApps and Photoshop). If you are not a heavy user of such software, you probably won't miss G4 power a whole lot, and you will benefit from the G3's lower cost, lower heat-generation, and lower power consumption. 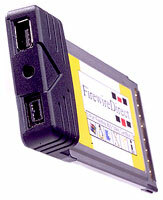 FireWireDirect.com has announced the industry's first FireWire 800 CardBus/PCMCIA adapter for Type II slots. The new FireWire 800/1394b CardBus Adapter offers two ports, a 9-pin FireWire 800 port for connecting new 800 Mbps FireWire 1394b devices and an independent legacy 6-pin port for 400 Mbps FireWire products. The separate legacy and 800 Mbps ports are each capable of supporting up to 63 devices with no negative performance impact on the newer, faster FireWire devices while maintaining compatibility with existing cables. 800 Mbps FireWire possesses all the same features that make FireWire the standard for digital data transmission and storage, but FireWire 800/1394b doubles the performance. The new card is fully compliant with this new implementation of the FireWire standard, offering speeds of up to 800 Mbps (twice as fast as the existing FireWire standard) along with enhancements to data integrity that will make FireWire 800 even better suited to digital video and audio work. Daniel Jackson, FireWireDirect's Chief Technical Officer, says FireWire 800 is cause for excitement: "FireWire is already the technology of choice for high speed peripherals. This new CardBus brings this technology to a more portable format." The new FireWire 800/1394b CardBus employs the latest and most powerful Texas Instruments (TXN) OHCI-Lynx chipset. Keyspan is now shipping a new line of retractable computer cables. Keyspan's ZIP-LINQ retractable cable line consists of over a dozen USB, FireWire, PDA, camera, phone, and ethernet connectivity solutions. Keyspan's ZIP-LINQ cables are available to resellers via Ingram Micro and to consumers through leading catalogs and online resellers. Pricing for the cables ranges from $13.99 for retractable USB cables to $15.99 for retractable Palm or iPaq Sync+Charge cables. "Mobile computing is on the rise", noted Mike Ridenhour, president of Keyspan. "Many computer users need to have USB, FireWire, phone, and ethernet connectivity when traveling - yet the tangle of cables can quickly fill their laptop bag. Our ZIP-LINQ retractable cables are quite small - about the size of a quarter - yet expand to 30" or more. They are easy to carry and convenient to use." The cables feature a remarkably compact form factor. The cable extends to 30" or more by pulling on both ends. Simply pull again and the cable retracts back into its durable housing. The new ZIP-LINQ cables distinguish themselves from competitors in two ways. First, the cables are more compact than cables available from other companies. Second, the ZIP-LINQ line offers an unmatched breadth of retractable cabling solutions. Village Tronic's VTBookDD CardBus graphics card [link was not working when we posted this article] makes it possible to connect a digital or analog high-end second display, converting a notebook computer into a full desktop workstation driving two displays simultaneously. People have been discovering the joy of ever smaller notebook computers. The more compact they are, the more comfortable it is to carry them everywhere. However, the majority of the time the notebook is used on our workdesk at the office. In this situation, after hours of working, many users prefer a larger display. VTBookDD (short for Village Tronic Book Desktop Doubler) plugs into your CardBus PC Card slot and allows the connection of high resolution displays, both digital (DVI) and analog (VGA). Thanks to 32 MB of memory, it supports even the highest resolutions in maximum color depth (16 millions of colors) with very fast refresh rates to ensure maximum comfort. The display controlled by the VTBookDD is a true second display. This means that it offers additional display space for your use. You can move and arrange windows from the notebook's display to be shown on the display being driven by the VTBookDD. Mirroring, primarily for use in presentations, is also supported. No other device will impact the way you work like a second display. Use more display space. Forget about workarounds such as closing and reopening multiple windows or zooming and scrolling simply because your notebook display is too small. Keep palettes, your email-client and other applications continuously open to stay focused on your main project window. This enables you to concentrate on the project and not on navigating to squeeze out display space. Noisy hinges on your iBook bugging you? Silence them with iGlide. iGlide is a do-it-yourself kit for silencing noisy, creaking iBook hinges without disassembly. The kit contains an exclusive metal conditioner formula that works in ways oils and lubricants can't. A 2 mm hex wrench is also included for re-seating the case fasteners. Prolongs hinge, display and case life. Quiets noisy, creaking display hinges. Extremely long-lasting hinge lubrication - benefits remain even if washed off! Works in ways oils and lubricants can't - iGlide outperforms them all. Easily user applied in 5-10 minutes. iKlear safely cleans all LCD/laptop displays & computer monitors with a unique 3-step liquid polymer-based formula that lifts and dissolves surface contaminants and fingerprints, floating debris off the screen surface, leaving an antistatic coating which dramatically reduces surface friction & wear, resists fingerprinting and provides a renewable protective screen barrier. Don't clean your expensive laptop or computer screen with a $2 glass cleaner & a paper towel! iKlear's award-winning formula is antistatic, 100% nontoxic, environmentally friendly and is the most "recommended", non-damaging, alcohol & ammonia-free screen cleaner you can buy. Klear Screen is a BMUG Choice Product award winner. Soon after the first "slim" Lombard PowerBooks were released in 1999, users noticed distracting marks on their LCD screens after a short period of use. These marks result from the LCD screen coming into contact with the PowerBook's keyboard when the lid is closed. Oil from your fingertips transfers from the keyboard to the screen, leaving the unsightly marks. 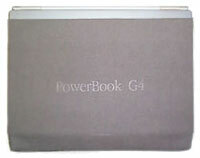 The PowerPad is a thin piece of leather which slips between your keyboard and screen when your PowerBook is closed. No more marks on the screen! Challenge after challenge was created and met utilizing iKlear Apple Polish technology when the new Flat Panel iMac was introduced in January 2002 at Macworld. A full-size Flat Panel display screen, clear acrylic screen surround for adjusting optimal viewing angle, high-luster chrome pivot tube, low-luster designer case materials and DVD players in every model. iKlear Apple Polish will clean, protect and preserve every surface you can either see or touch on the new iMac. The iPod also benefits directly from iKlear Apple Polish surface preservation technology - removing oil and fingerprints while cleaning and preserving the clear acrylic front panel and controls, LCD display and chrome back. New Color Ltd. specializes in selling Apple computer accessories and peripherals online. Shields notebooks from oils, dirt and abrasions. never buy another wet wipe! Clean CDs/DVDs, too. Removes prior LCD screen abrasion (keycap marks). Ultra-tough and light cloth lasts for years. Won't wrinkle, fray, frock, run, or tear. Effective and economical screen cleaning solution. No oily residue or shedding like leather. PowerSleevz notebook cases elegantly protect the exterior finish of your computer from all of life's little bumps and grinds. Made from a heavier-gauge version of our ScreensavRz fabric, the case stretches on like a glove, hugging every curve. Extremely lightweight, flexible and durable like our popular ScreensavRz, the case weighs just 40 grams. This case folds up small enough to easily fit in your pocket. Protects exterior painted finish of PowerBook G4 and the iBook's polished plastic from your larger case's zippers and hardware, or anything else lurking out there. A great, hassle-free tote when you just need to take the 'Book. Elegant debossed "PowerBook" or "iBook" text on one panel. Made from our exclusive Optex fabric. Clean and polish anything with it, including the screen! Fits your 'Book like a glove. Enhances your grip when carrying. Debossed "PowerBook" or "iBook" logo on one side. Even get your own custom logo! Click here for details. The sleek, minimalist SleeveCase keeps your laptop out of harm's way without taking up much valuable space. A plush layer of high grade neoprene wrapped in a Ballistic shell surrounds and protects your computer. The ultra smooth neoprene skin makes sliding your laptop in and out a snap. Available in twelve sizes with the lead indium trim. Optional upgrades include a flap, suspension shoulder strap, and piggyback.